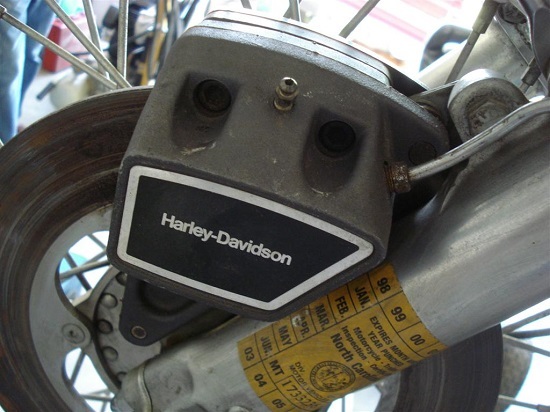 The single disc "pie-slice" brake caliper was found on 1974 thru 1977 Harley-Davidson Sportsters and FX models. Rebuilding the caliper includes removal, disassembly, cleaning, inspection, reassembly, re-install, and bleeding. 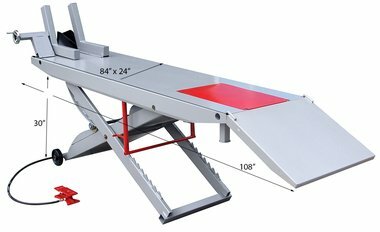 No special tools are needed. Taking your time, rebuilding a Sportster/FX caliper should take a few hours. Tools needed include a few wrenches, a socket set, Allen keys, and an O-ring pick. You will also need brake parts cleaner, new brake fluid, and rags. Caliper rebuild kits are inexpensive. You may also need to order brake pads or a caliper piston. All are available from several suppliers, including J&P Cycles (read Classic Bike Resource Guide). Start by draining the old brake fluid from the caliper. Remove the brake line by using a flare-nut wrench, so as not to strip it. It's a good idea to loosen the bolts which hold the caliper together while it's still mounted to the bike. Some of these may be very tight, and trying to loosen a tight bolt while the caliper is off may be difficult. Also loosen the bleeder valve. Remove the caliper from the bike. Place in a plastic or metal tray and drain any remaining fluid. Spray/clean all parts with brake cleaner and a stiff brush, remove all dirt, rust, abrasives and old brake fluid. Dry with compressed air. 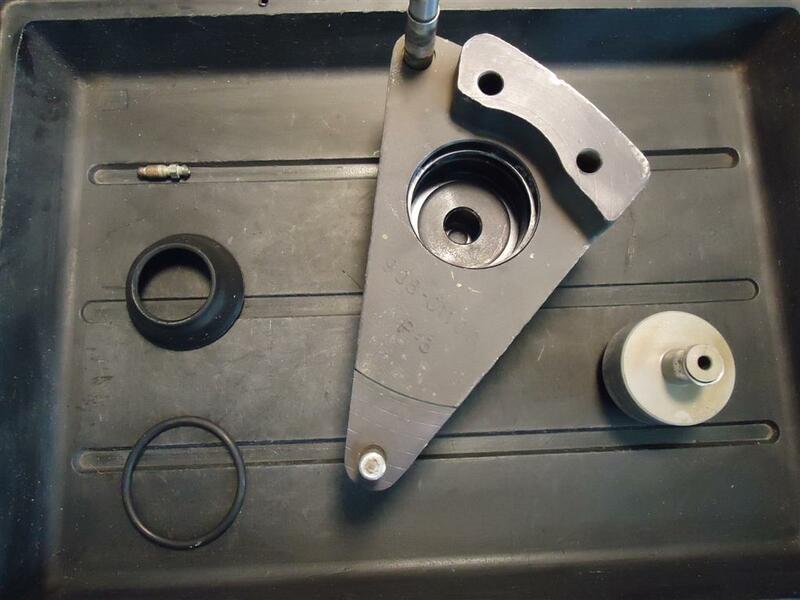 Pull off the rubber boot around the caliper piston, using something that won't damage the caliper bore. Corrosion built up between the piston and bore is usually what makes the piston stick. 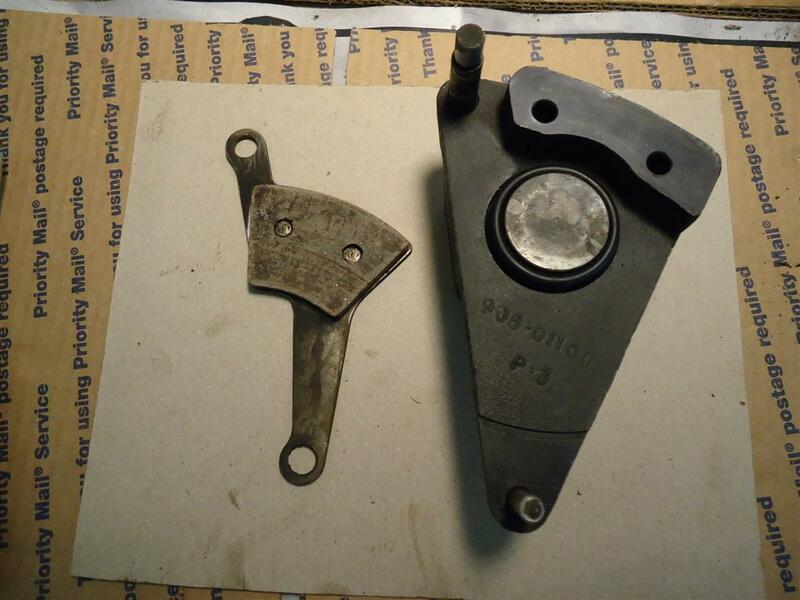 The caliper piston can be stubborn to remove and there are several ways to go about this. The easiest way is using compressed air from your compressor. Hold the the caliper away from you. Wrap a shop towel around the it or use a piece of wood to stop the free piston from coming out (don't use your fingers). If you don't do this and shoot in too much air, you may launch the piston across the garage (I did that with once with a car caliper). Insert the rubber tip of an air nozzle into the hole where the plug goes in and press the trigger. Hopefully the piston comes out. If not, soak the piston with WD-40, let sit for a day, and try again. To remove the piston without air, you can press in the brake lever after the caliper is off the bike but before removing the brake hose. After you have removed the piston, remove the o-ring from inside the bore. There is also a small o-ring on the back of the piston. Both of these o-rings will be replaced. Clean out all of the passages and the piston chamber with brake parts cleaner and compressed air. Allow to air-dry. After spraying/cleaning the bore and other parts with brake parts cleaner, dry with compressed air. Carefully inspect the piston and piston chamber. The piston should have a smooth, polished surface. 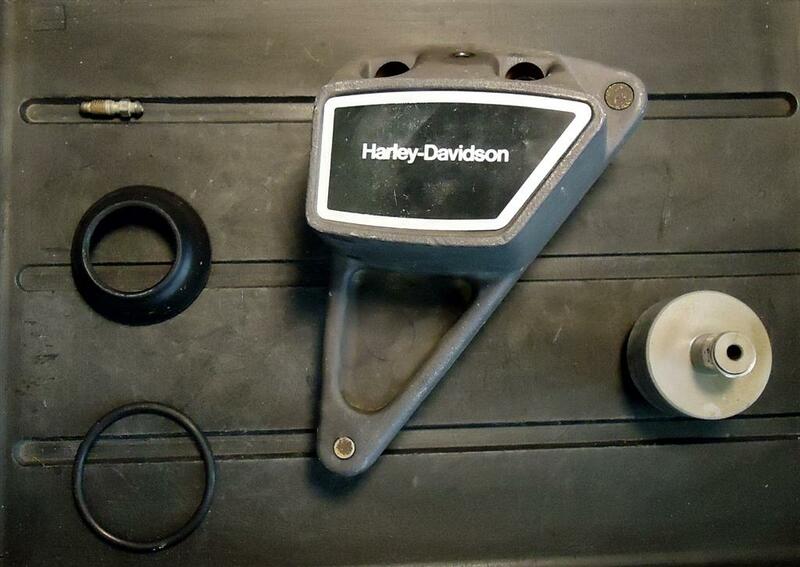 Nicks and scratches on the piston will tear the o-rings and cause failure. Replacement pistons are available (carefully measure the size). Minor pitting of the piston bore can be cleaned up, and small scratches can usually be taken out. Try lightly sanding with either emery cloth or wet 600-grit wet-or-dry paper. A rule of thumb here is if a groove can catch your fingernail, its going to need to be re-sleeved. The brake pads should have an indicator groove on them. If you don't see one, the pads are probably worn beneath minimum thickness. Another way is to measure the brake pad thickness. If the linings are less than 1/16" they need to be replaced. The FX/XL pie-wedge brake pads are simple to replace. It requires drilling out the original rivets (use a 9/64" drill bit) and riveting in the new ones. If you don't have a rivet gun and can't borrow one, the original brass rivets can usually be re-used and installed using a punch and a hammer. Brake pads should always be replaced in pairs. Double check that all components are clean and dry. Pour a little fresh brake fluid into a small container (DOT 5 - don't mix fluid types). Lubricate the small o-ring with brake fluid and install on piston. 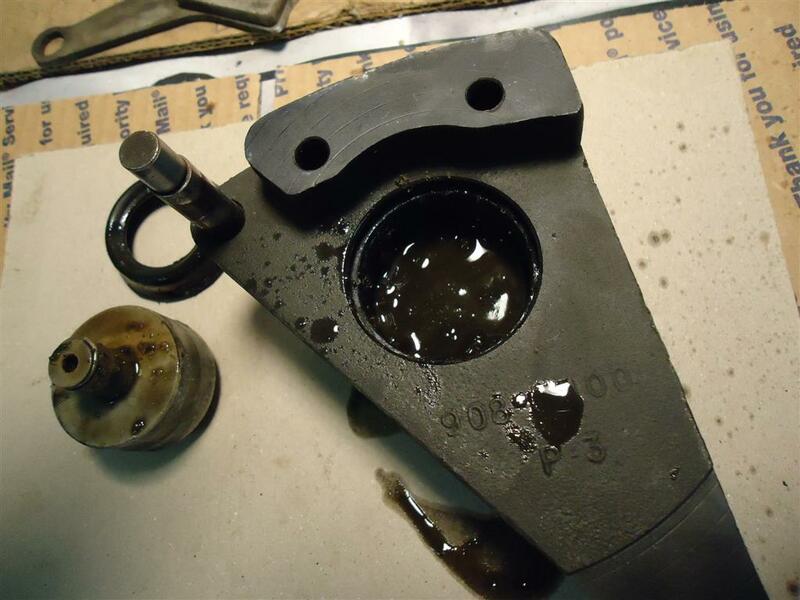 Lubricate the piston with brake fluid, and slide it into the bore. Once the piston is in straight, it should slide all the way in with moderate finger pressure. If not, find out why. Don't force it in! Coat the seals and o-rings before putting them in place. Add the outer dust boot. Next, refit the pads with the piston pushed all the way in. This makes it easy to fit the caliper over the brake disc. Your Sportster caliper rebuild is now complete and ready to be installed back on bike. Use new locknuts with the two mounting bolts. If new locknuts are unavailable, use thread sealant. 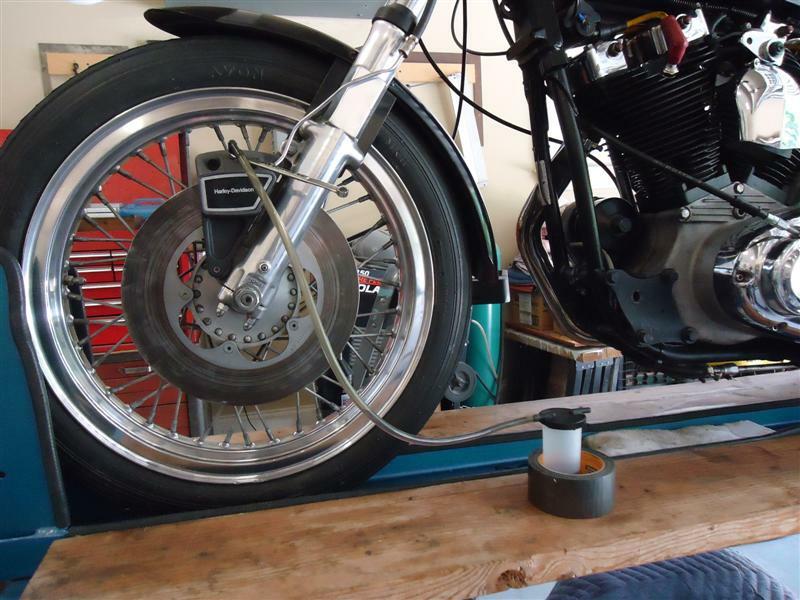 On my 1976 XLH, the caliper mounting bolt are tourqued to 35 foot-pounds. The two torque-arm bolts are tightened to 130 inch-pounds. When done, check that the caliper floats freely back and forth. Re-install the brake line. Tighten bleeder screw. Don't over-tighten, it may cause bleeder screw seat damage. 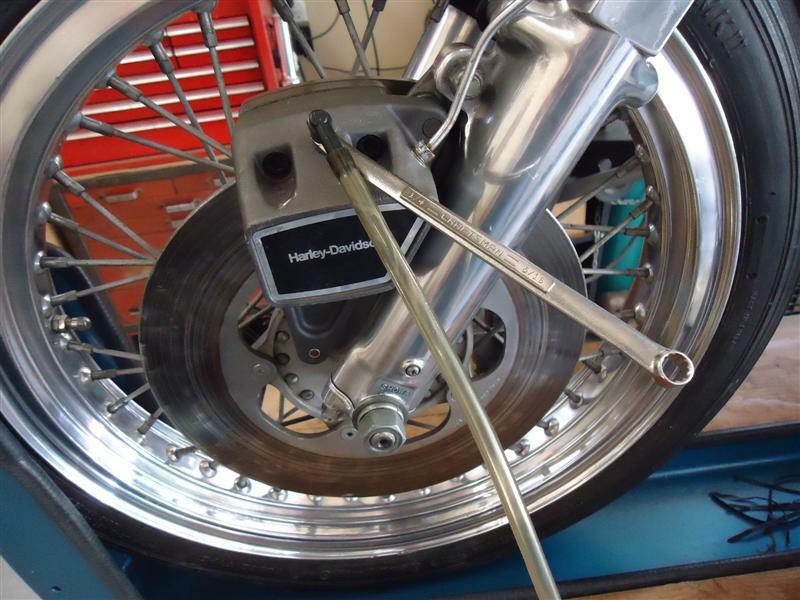 All disc-equipped Ironhead Sportsters require DOT 5 brake fluid, not DOT 3 or 4. 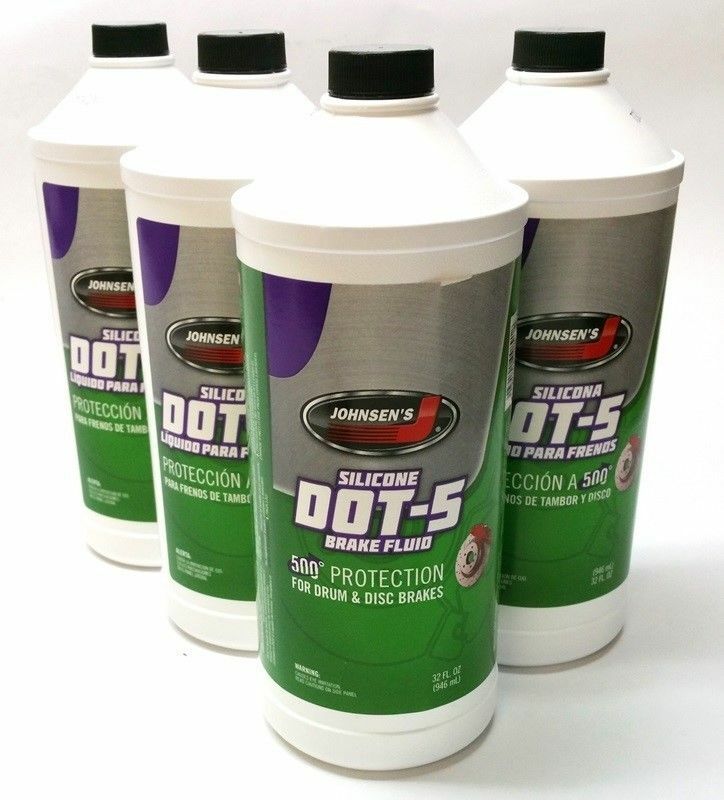 Conventional brake fluid will damage paint, DOT 5 will not. Do not mix fluid types. An easy way to find out which brake fluid type you have is to put a few drops of it in a styrofoam coffee cup. Glycol dissolves the cup, silicone does not. Turn handlebars until master cylinder is level as you can make it. Check that the bleeder screw is tight, then fill reservoir slowly with brake fluid. Keep the lid of the master cylinder loose while you're bleeding the brakes or a vacuum might form. Bleed until clear brake fluid comes out, and all air bubbles are gone. When you're done, tighten the bleeder screw. Your hand brake lever should now be firm to the grip.